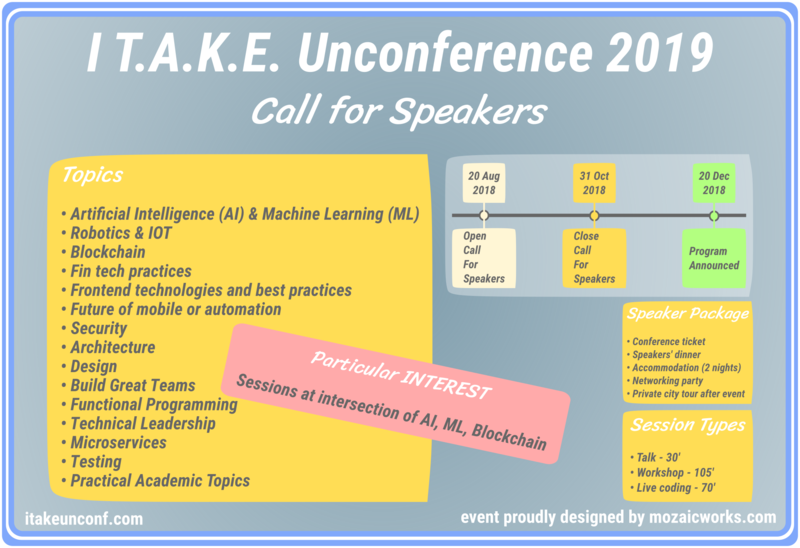 Send your proposal to become a speaker at I T.A.K.E. Unconference 2019. This year we are interested in specific topics, and choosing one of them might get you closer to becoming a speaker. If you have a very clear idea of who your audience is going to be, make the exercise to think from their point of view. They choose to attend your session, and they expect the best value from their investment. Every audience is unique, so craft your proposal according to what you know about your audience and about the event. Try to bring an original approach for each session you submit. When you apply, make sure you have an excellent title, a clear description of what you want to present and a strong personal bio. Although it might seem at hand, making a proposal takes time. Make sure you follow the guidelines offered by the organizers and when in doubt, ask for more details. Make sure you offer the details requested in the application. You’ve seen the call, you got your information in order and you are pretty sure you want to make a submission. You can read more in detail about our tips here. Have any questions about the call for papers or the Unconference? Let us know in the comments.